What a great moose season we had at Ross Lake Camps this year! Coming back into the late spring and early summer seasons was worrisome for both the deer and moose populations in Northern Maine after the record setting snowfalls that just kept dumping out of the sky last winter. State Biologists, Game Wardens, Camp Owners, and Guides were all worried about what effects the deep and prolonged snow pack had made on the populations. The Moose in some areas were hit hard, but our fears out here in the North Maine Woods where we hunt, were quickly put to rest. By the end of June we were regularly seeing cows with calves out feeding in the late afternoons and evenings. In July we were viewing many bulls along the road sides while traveling back and forth to our favorite fishing spots. When bear season was in full swing we were seeing an abundance of moose near last light while picking up the hunters every evening. Happily, things were looking just as normal as ever for all parts of the moose population from the cows to the young bulls to those giant racked old dominant bulls. As usual, we couldn’t wait for the hunt to begin! Opening day of season was a very cold 25 degrees, a nice contrast to the record setting heat we had for the opener in 2007. The rut was in full swing, and to mix that in with the cool temperature was a sure combination for success. Bob Burns and his son Bob Jr. didn’t waste any time taking a huge trophy bull after spending more than 20 years waiting for one of their names to get drawn in the permit lottery. Registered Maine Guide Dana Packard had a prime spot all scouted out, and he had Bob and Bob set up in a blind early on Monday morning. Dana cow called and bull grunted for about an hour until his guys got cold and wanted to make a move. They walked back to the truck and started to drive. When they made it around the first curve Dana spotted a big bull coming out of the brush and heading right to where they had been calling from. He got the guys out of the truck and set up for an offhand shot. Bob Jr. let his rifle do the rest of the work, and he laid the monster right down. Not only was this the first bull of the season for us at Ross Lake Camps, but it turned out to be the heaviest one taken out of camp this year as well. The trophy measured up with a 40 inch wide 6X5 rack on top of a massive 920 pound dressed out body. Maine Master Guide Bob Smith and his hunter, Mark Fanning of Bar Mills, ME had a close encounter of the huge kind on Monday afternoon. Mark was hunting in zone 1 and looking for only one of the biggest bulls that Maine has to offer on a trophy hunt. The guys were doing a lot of walking and calling using a spot and stalk approach, and several moose that didn’t live up to Marks standards were seen throughout the day. Late in the afternoon Bob spotted a huge set of antlers ahead of them on an old overgrown road they were walking. They got within 115 yards, but there was a thick screen of brush between Mark and the Bull and no clear shot was ever presented. Bob was able to count 22 points on the massive wide palmed rack and estimated it at a minimum of 55 inches of spread. After throwing every call in the book at the monster, the guys were finally winded, and that moose moved on to greener pastures. Mark did have shooting opportunities at 5 other bulls of varying size throughout the week, including one with an estimated spread of 48” – 50” on Friday morning, but it had an antler deformity on one side. Mark stuck to his guns and stayed the trophy hunter to the bitter end, taking his tag back home with him on Sunday morning. A risk that any tried and true trophy hunter will tell you must be faced on any given hunt. Every hunter in camp had action from the moose on Monday although not everyone encountered a shooter bull that was willing to present a shot opportunity. The bulls were talking a lot, but many seemed to be hung up with groups of cows that they were unwilling to leave. Persistence pays, so the guides and hunters went right back to work early Tuesday morning! The moose are so great at Ross Lake Camps that even our cows have horns! Mike Manca of Templeton, MA was the first to score on Tuesday morning. He was here hunting on a cow tag in zone 1, and wanted the satisfaction of completing his hunt on his own without a guide. His dream was realized when he shot a moose that he spotted in the edge of the woods from about 140 yards away. When he walked up to his cow, it actually turned out to be a young bull with short spike horns. That counts as a perfectly legal antlerless moose in Maine as long as the horns do not stick out longer than the ear tips. Mike left camp with what will probably be some of the best table fare of the season, a spike horned bull that dressed out at 497 pounds. Congratulations Mike! Just a short time after Mike was shooting, Jim Mackay of Tewksbury, MA was having some heart pounding action down in zone 4. Maine Master Guide Bill Orne had Jim set up in a blind along an old green road and he had a bull coming in to them with a series of cow calls. After a short time Bill was able to determine that there were actually 2 separate bulls coming in to the set up through the woods. One Bull came out of the woods a few hundred yards away and Bill was able to see that it was a good Moose, but he was unable to give an accurate size estimate from that distance. The moose circled back into the edge of the woods out of sight, and the guys were able to run in the brush edge to close about half the distance. They set back up at about 150 yards from where the moose was standing and Bill called again. The moose stepped back out into the open and Jim saw clearly that this was a moose that he wanted to take. He made a spectacular shot dropping that moose in its tracks. Jims trophy measured up with a 45 inch wide 8X9 rack and a dressed body weight of 793 pounds. After Jim delivered his moose to a processor out in town, he returned to camp and used an electronic call to kill a 39 pound old male coyote. Congratulations to Jim on an outstanding week of hunting. Two more hunters were able to seal the deal on Wednesday. Bob Kane of Williamsburg, VA had seen plenty of moose on the first 2 ½ days of the hunt with his Guide, Tom Greenlaw. They just hadn’t found one quite big enough for Bob, until they were having a lunch break on Wednesday afternoon. Tom had set them up with their truck parked on an edge of an old cut and hooked up the electronic call to play while they had a picnic lunch from the tailgate of the truck. When Bob walked around the side of the truck to get something out of the cab he spotted a Bull stepping out of the woods into the open cutting. He grabbed his rifle and made a great shot on this old bull that ended up going 40 ½ inches wide with a 7X7 rack and hitting the scales at 756 pounds. Charles Monte from Lyme, CT also got the job done that day when his Guide, Travis Willette, spotted a bull crossing a skidder trail while they were traveling to a new hunting spot. Travis was able to get Chuck set up for a 60 yard offhand shot and he made a cow call to turn the bull broadside for the shot. This bull had a very unique set of antlers lacking palmation, but having absolutely huge mass on the main beams and all of the points. It measured out at a width of 42 inches, had 8 points and an estimated dressed weight of 725 pounds. Thursday belonged to a hunter by the name of Tony Russo from Westbrook, ME. He was led by Registered Maine Guide and camp owner, Don Lavoie. Tony had some hard luck with some gun issues when he arrived at camp. His gun and scope may have been knocked out of alignment during his trip up to camp, and were not performing at long distances, so Don had the added challenge of bringing the moose in closer to compensate. Several different bulls were seen by the guys throughout the week including a shooter on Wednesday that had to be passed up because it winded the guys from about 200 yards away. That didn’t matter though on Thursday when Don spotted 2 nice bulls fighting while the guys were making their way into a blind to do some calling. The stalk was on, and Don was able to get Tony into a 50 yard shot. After sizing the 2 animals up, Don let Tony know which one to shoot, and he took home a beautiful Bull with a 47 inch wide rack that had 9 points on one side, 7 points on the other, and dressed out at 851 pounds. That was sure an exciting hunt! The last group of hunters for the early season was with tag winner Brian Beckman from Bath, ME. Brian and his crew decided to go it alone for the hunt without a guide since they were not trophy hunting on their bull tag, but they had some trouble getting into the right spots at the right times. They had seen plenty of cows, but just couldn’t seem to spot a bull, so at the end of the week they asked for some help. Maine Master Guide Bill Orne was available after having successfully completed his hunt earlier in the week and so Bill went back to work. On Thursday afternoon he took the guys into a spot to do some calling and Bill brought out a very pretty young moose for the guys to shoot. The September moose season was finished off with this moose that sported a 36 inch wide 4X4 rack and dressed out at 733 pounds. We had a long wait in between the September and October Moose seasons this year because of the way the dates happened to fall. The October season fell a little late this year, and the rut was O-V-E-R….over. We kept a close watch on moose in the area and kept returning to the rubs and scrapes that we had scouted and hunted during the September hunt. Over 30 different scrapes were checked prior to the arrival of the hunters, and every one of them had gone cold. This hunt was going to be a spot ‘em and shoot ‘em in the feeding areas for sure. Just to add to the challenge, the full moon fell right in the middle of that week as well. No worries at Ross Lake Camps though! We have extensive knowledge of our hunting area here, and the experience to make things happen even in the toughest conditions. The first moose of the late season was not a giant one, but it was very special to us here. Joe Pelleteir, a 100% disabled Vietnam Veteran had drawn his first moose tag ever. Joe’s health forces him to be on oxygen at all times, so long walks into hidden hunting spots are not an option. Maine Master Guide Bob Smith was up to the challenge of helping Joe remember this hunt for all his days to come when he spotted a bull feeding on some leaves in an old woodyard. Joe and his buddies loaded up a 31 inch wide 4X3 bull with an estimated weight of 640 pounds to proudly take into town. Congratulations to Joe just for coming on this hunt, his perseverance and tenacity are an inspiration for others to look up to. Chris Patnode from East Hampton, MA was next. 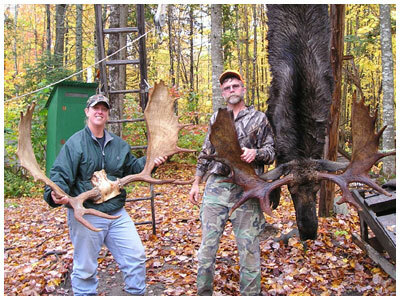 Registered Maine Guide and camp owner Don Lavoie was in the lead on this hunt, and he was finding some moose for Chris. Many cows were spotted early in the week in the feeding areas, as well as a couple of small bulls. There was some great excitement Tuesday morning when the guys saw a huge bull estimated to be in the neighborhood of 52 – 53 inches wide with great palmation and a lot of points. The problem was that the moose was on a road edge 30 minutes before legal shooting while the guys were on their way to their target hunting area. The rut was over and the bull was not interested in cow calls to make him stay put. The animal grew cautious and ran off into the timber well before it would have been legal to shoot. On Wednesday evening Don spotted a large bull near a green road that they were travelling down. He was able to get Chris (using a .50 cal muzzleloader) and his subpermittee set up for a shot. The bull whirled just as Chris was pulling his trigger and his shot hit the moose in its flank. After jumping the bull once while following the blood trail, Don made a great call to back off for a few hours, and the guys did catch up with that moose about 500 yards deep in the woods. Our work was cut out for us, but we are prepared here for all situations, and at 4:00 am we returned to camp with an awesome bull in one piece that carried headgear measuring 49 ½ inches wide with an 8X7 point rack, and a dressed weight of 791 pounds. The last man standing for the season was Arthur Cheer from Stockholm, NJ and he was being guided by Maine Master Guide Bill Orne. 5 different shooter bulls were seen throughout the week, but they weren’t hanging around long enough for Artie to get into a good set up to take a well placed shot. On Thursday morning a young 4 point bull stood stock still in a skidder trail, and Artie set up on a pair of shooting sticks and watched him for about 5 minutes before deciding to let the bull walk in hopes of an opportunity at something bigger. On Friday morning at first light Artie got his wish when Bill spotted a good bull on the road edge just after departing from camp for the morning hunt. They were able to get set up on the bull from about 80 yards away and the moose never went any farther! This bull finished out our 2008 season with a 9X7 point 43 inch rack and a dressed weight of 750 pounds on the nose. What a spectacular season 2008 turned out to be for our annual moose hunt! In a year with such grave concerns about the health of the animals, and also difficulties for hunter opportunities because of the skyrocketing costs of fuel, equipment, and supplies this was outstanding. We did send our first client in 7 years out of camp with an empty tag, but it’s hard not to count that hunt as a success with the action that was seen. This one is officially in the books, and we’re already looking ahead to the action in 2009! If you are interested in more information check out the website at www.rosslakecamps.com or contact Don & Andrea by phone at 603-320-3208.